You have added Anarkali Suit with Floral Zari Embroidery in Dark Green to your Shopping Bag! 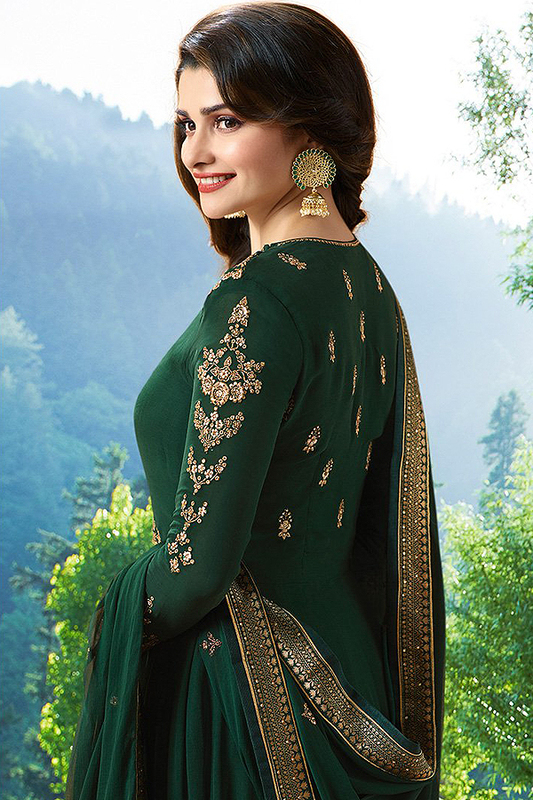 Steal this graceful look of Prachi Desai in dark green floor-length georgette anarkali suit! Intricate floral zari embroidery along the neckline, sleeves, back and waist complement the zari butis with sequins and stone work along the bordered hem. The ethnic look gets complete with a matching chiffon dupatta featuring golden lace border. The dupatta is embroidered with beautiful small floral zari butis with stone work. It comes with a matching unstitched bottom in shantoon fabric. Accessorise a bit and you are ready to attend any special occasion. Beige and Turquoise Green Heavy Embroidered Net Georgette..